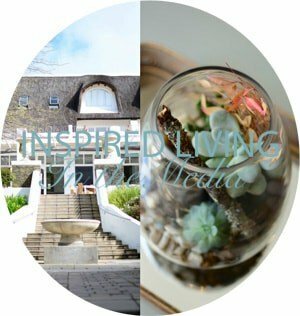 I recently wrote a post which featured some of the great eateries Franschhoek has to offer. 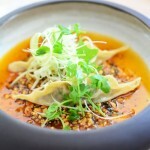 One of the restaurants I mentioned in the feature was Bistro Allee Bleue. 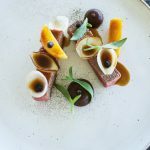 The Allee Bleue Estate is located a few minutes outside of the town of Franschhoek, just off the R45. 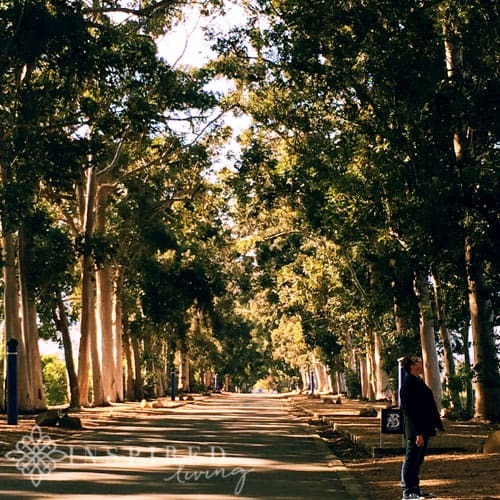 Allee Bleue (blue avenue or drive) owes its name to the statuesque, blue eucalyptus trees that magnificently line the entrance to the estate. 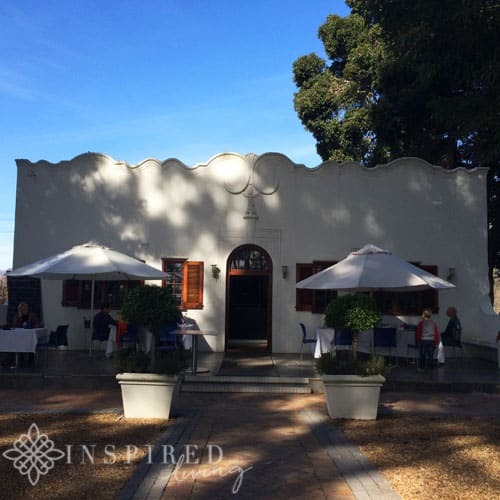 The estate has an unmistakably French feel, being part of the Franschhoek Valley (or ‘French corner’). 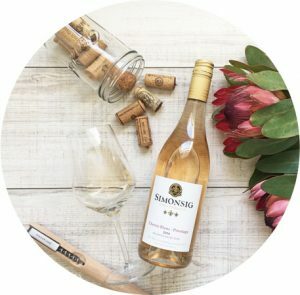 Picture perfect rows of vines, fields of lavender and meadows, stretch towards the Drakenstein Mountains in the distance. 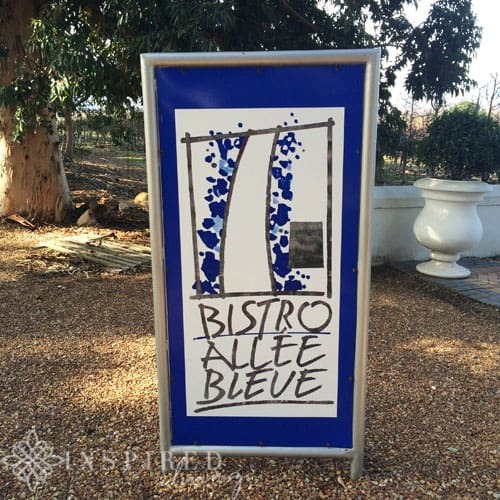 As you enter the estate you will find Bistro Allee Bleue directly on your right. The Bistro offers breakfasts, light lunches, afternoon tea and cakes, as well as a full à la carte menu. 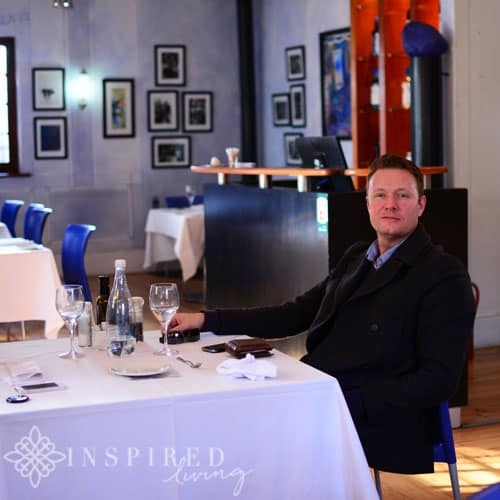 Chef Beau Du Toit recently introduced a new menu at Bistro Allee Bleue, which Grant and I had the opportunity of tasting. 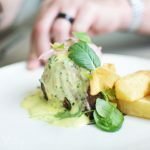 The new menu focuses on using in-season, local produce and a variety of fresh herbs, grown in the estate’s herb tunnels. The bistro has an elfresco dining area, including a kiddies play area, perfect for warmer weather. 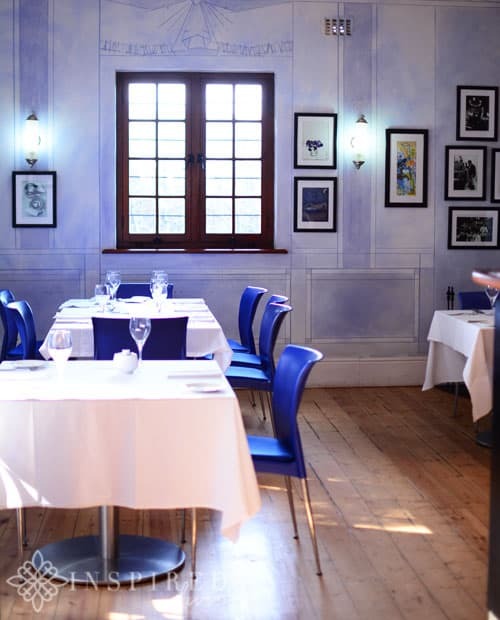 Inside, crisp white tablecloths, blue chairs and blue-wash on the walls, emulate the estates “bleue” theme. We started lunch with a glass of the Allee Bleue Brut Rosé, which was perfect, as it was a rather balmy winters day! 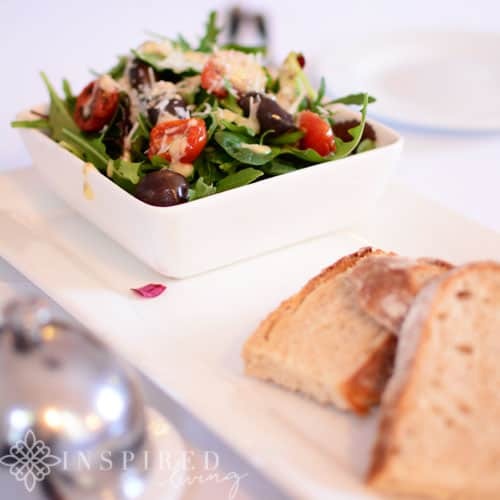 Before ordering our starters, we were offered a complimentary herb salad with farm baked bread. I think that this is a really nice touch, especially if you are not planning on ordering starters. 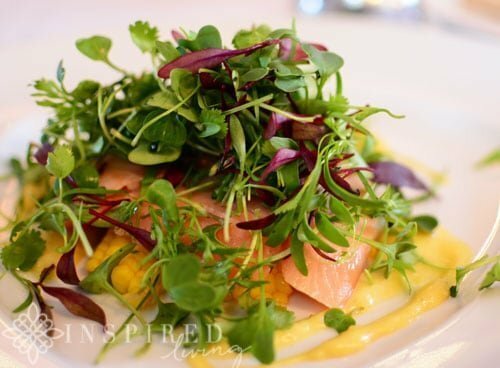 For starters I decided on the Smoked Salmon Trout with coriander, mint, sweetcorn, pickled chilli, garlic and a lemon aioli. My starter was absolutely delicious! I loved the sweetness of the corn, which was off set by the heat from the pickled chilli and the zingy citrus from the aioli – it all complimented the smoked trout really well! For mains I had to try the Venison and ‘skaap stertjie’ Burger, which I had heard so much about! 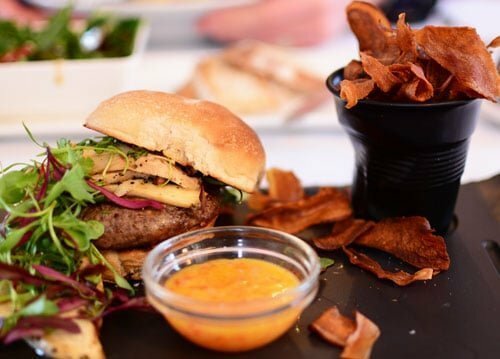 The burger is served with sautéed wild mushrooms and thyme, sweet potato chips and a homemade sweet chilli mayo. The earthiness of wild mushrooms worked really well with the burger and I loved the sweet potato chips! 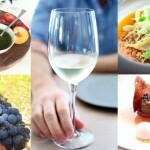 I decided to pair my dish with the Allée Bleue Shiraz, which complimented the dish perfectly. Grant opted for the Pulled Pork Shoulder Pie, which came highly recommended by our waitress. 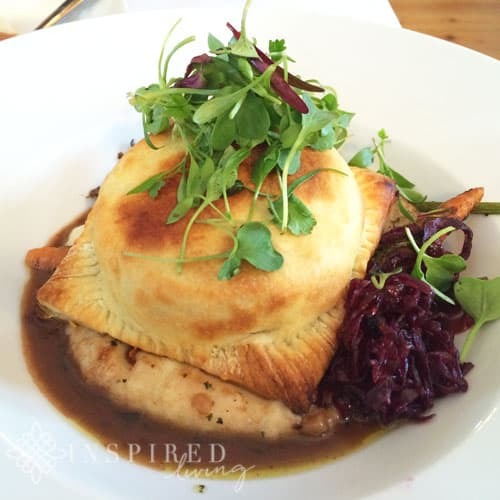 The pie is served with mash, gremolata, caramelised root vegetables, pickled cabbage and gravy. 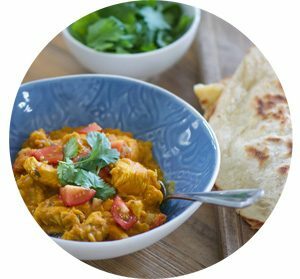 We both agreed that this was the winner out off the two main dishes we tried – it was utterly divine! I am not entirely sure how but we managed to squeeze in a desert – but we did! 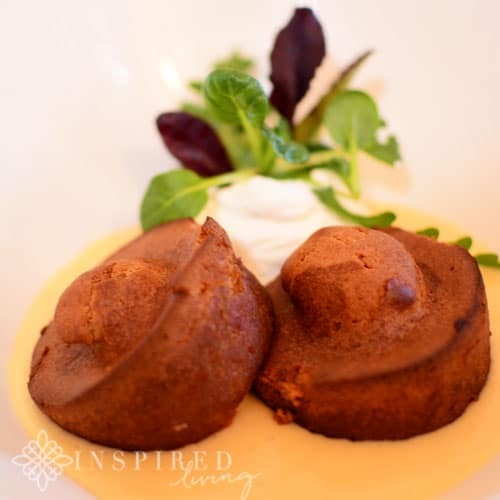 We both thought that the Malva Pudding with custard and cream was the perfect way to end our meal! We really enjoyed our lunch at Allee Bleue Bistro. 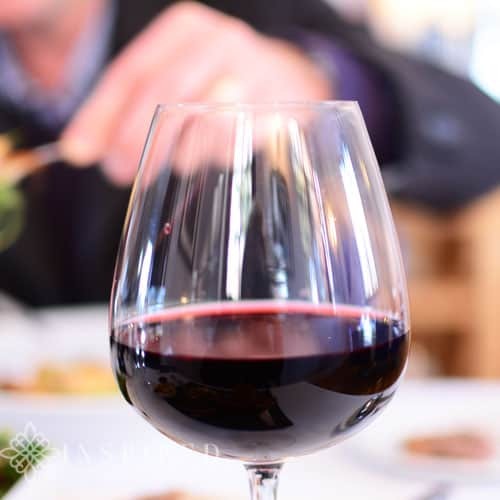 Great food and wine, topped off by friendly service, made for a wonderful experience! Location: Intersection R 45 and R310, Groot Drakenstein 7680, South Africa Contact: For bookings please email or call on 021 874 1021. 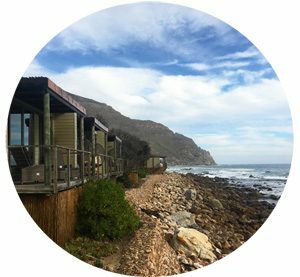 Allée Bleue Bistro is open from Tuesday – Sundays & Public Holidays 08h00-17h00.